Trade Show Exhibit Displays - Drive traffic in the exhibition hall and achieve sales goals with a high-impact exhibit display that effectively delivers your trade show marketing message, meets your budget and maximizes exhibiting success. Trade Show Promotional Items - Drive traffic to your trade show booth and have attendees remember you long after the show is over with unique, appealing giveaways that reinforce your sales message and contact information. Direct Mail Services - Utilize targeted direct mail to generate leads, follow-up with trade show contacts, promote new products, and communicate specials. Services include design, writing, printing and mailing to your list or a purchased list. Email Marketing Services - Create targeted, powerful email campaigns that deliver your message to your target audience and support your trade show marketing and sales initiatives. Event Planning Services - Ensure your next event is a success and benefit from a full range of professional event planning services, designed to accommodate both small and large groups, and all types of venues. Sales and Contact Management Software - Enhance the ease of your sales management process with the right software tools that enable you to more effectively track leads, monitor sales, identify trends and uncover sales opportunities. 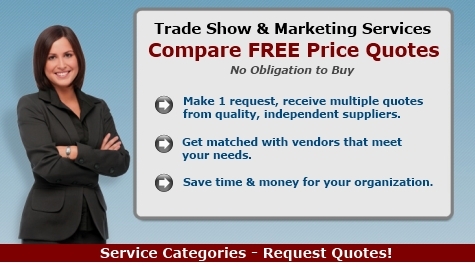 Telemarketing (Outbound) Services - Utilize telemarketing professionals to make personalized phone contact to support trade show follow-up activities, generate leads, sell products and services, and make survey calls. Purchase Targeted Mailing Lists - List Brokers - The right mailing list can make the difference between an average direct marketing campaign and one that delivers outstanding results. Engaging the help of a professional list broker will help you find highly targeted, relevant mailing lists of potential buyers. In addition to address information, lists can be ordered that include email addresses and phone numbers. Video Production Services - Create inspiring trade show promotional videos, product training tools and other business videos to show at events, conferences, meetings and online. CD and DVD Duplication - CDs and DVDs are excellent tools for trade shows and other marketing needs. Provide booth visitors with a disc that includes product demonstrations, how-to advice or other information designed to educate and garner sales. Interactive Kiosks - Providing a variety of services from simple to complex, interactive kiosks are user-friendly and act like virtual employees, collecting and delivering information quickly and consistently. BuyerZone.com is a separate entity from Trade-Show-Advisor.com and has established relationships with pre-qualified suppliers in a multitude of geographic locations. The publisher of Trade-Show-Advisor.com is not liable for quotes, products, claims or any work performed through BuyerZone or its suppliers. Disclosure: Trade-Show-Advisor.com is paid a commission for inquiries made through the above links that help fund publishing this website. Following are links to articles on this site that provide trade show promotional ideas and concepts that are designed to boost your exhibiting impact. Do you have a great tip that has enhanced your exhibiting results? Share it here! What works for you might help others. If you work in the trade show business, share your insights on industry issues and opportunities.